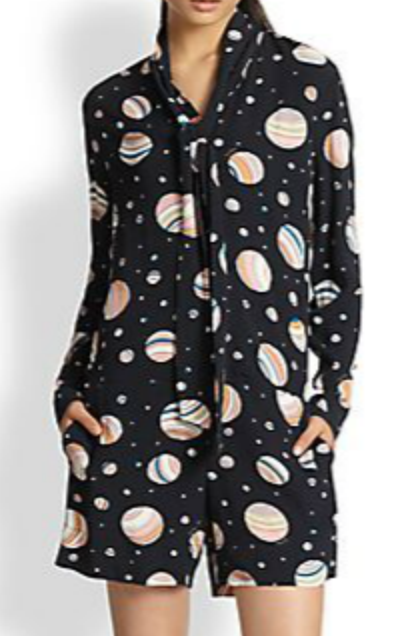 Our love affair with the jumpsuit continues… and “space-inspired” prints are an up-and-coming trend. We can thank Rodarte for kick-starting the look at New York Fashion Week in February when they showed their collection based on “Star Wars” screen prints, ode to the new Star Wars movie planned for release in 2015. Strappy sandals and open-toed booties NOW. Menswear flats and over-the-knee boots LATER. A bright blue clutch and bold gold cuff. Cinch and define your waist with a wide black belt. All one piece for no-brainer styling — pull on and go! It’s the LBD’s hipper cousin — works for daytime with flats or date night with heels. Whimsical print is unique and a real statement piece. Video | NYE Ball-Dropping Party Looks!